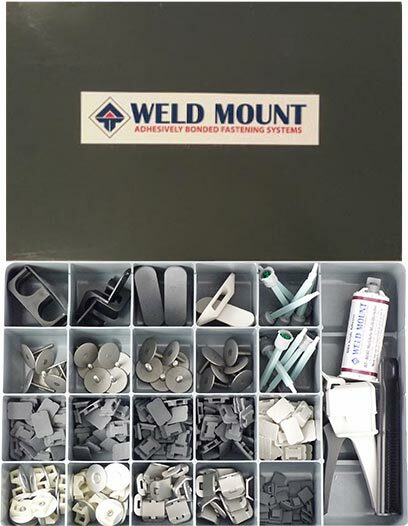 Weld Mount System has created several Kits with commonly used parts, or we can even create a Custom Kit if you would like. Each kit contains a wide range of parts,adhesives and adhesive dispensing gun* for you to try the Weld Mount System first hand. 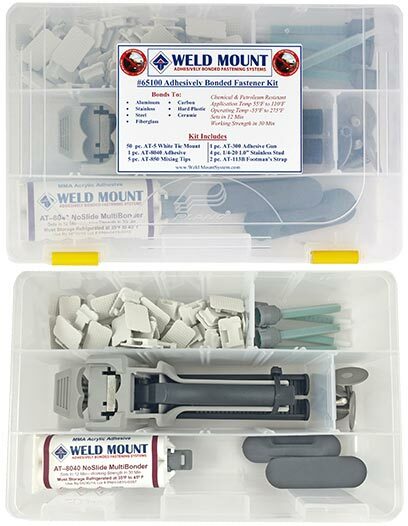 We sell this kit at our cost as an incentive for you to try our system and because we are sure you'll want to continue to use the Weld Mount System.. The AT-1050 kit contains one manual mix tube of AT-1030 adhesive and 25 pc of AT-5 white wire tie mount. Just enough parts for a small wiring job and ideal introduction to Weld Mount. 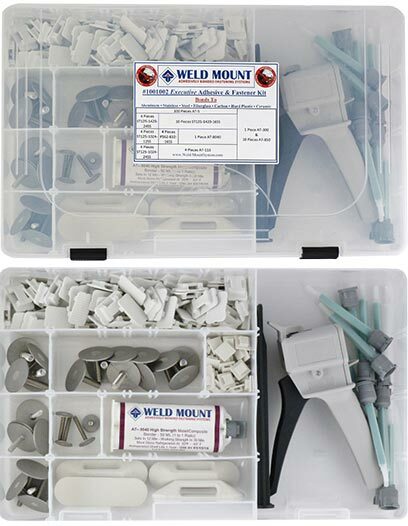 The AT-65100 Adhesively Bonded Fastener Kit Has a Variety Of Weld Mount Parts Designed To Give The User The Chance To Try Our Weld Mount System At Low Cost. The Kit Comes With A Dispensing Gun And Mixing Tips For Installation Of Our Adhesively Bonded Fasteners. The Kit Contains Our AT-8040 No Slide Multi-Bonder Acrylic Adhesive Which Will Bond To Almost All Surfaces Except Low Energy Plastic Or Rubber And Will Hold Up Even Our Heaviest Parts On A Vertical Or Overhead Surface. The Adhesive Sets in 12 Minutes And Is Heat Resistant To 225 Degrees. The Adhesive Should Be Refrigerated and Has A Shelf Life Of 9 Months. 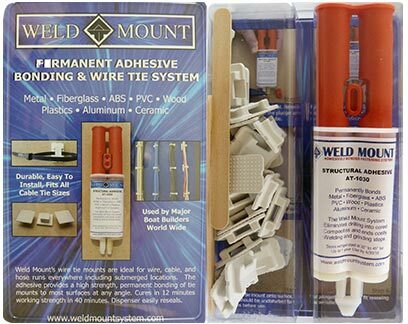 The AT-1001003 Executive Adhesive and Fastener Kit Contains A Large Selection Of All The Common Weld Mount Parts And Is An Ideal Kit For The Full Service Yard Or Custom Builder. The Kit Contains 1 Tube Of Our AT-8040 No Slide Multi-Bonder Acrylic Adhesive Which Will Bond To Almost All Surfaces Except Low Energy Plastic Or Rubber. AT-8040 Will Hold Even Our Heaviest Parts on a Vertical or Overhead Surface Without Fixturing. The Adhesive Sets in 12 Minutes And Is Heat Resistant To 225 Degrees. The Adhesive Should Be Refrigerated and Has A Shelf Life Of 9 Months. AT-7001 Industrial Fastener Kit Contains A Large Selection Of All The Common Weld Mount Parts And Is An Ideal Kit For Industrial Maintenance Shops. Supplied In A Heavy “Durham” Metal Box Which Is A Standard Rack Mounted System. The Kit Contains 1 Tube Of Our AT-8040 No Slide Multi Bonder Acrylic Adhesive Which Will Bond To Almost All Surfaces Except Low Energy Plastics And Rubber. AT-8040 Will Hold Even Our Heaviest Parts On An Overhead Or Vertical Surface Without Fixturing. The Adhesive Sets in 12 Minutes And Is Heat Resistant To 225 Degrees. The Adhesive Should Be Refrigerated and Has A Shelf Life Of 9 Months.